Jackpot 6000 casino games is a slot machine transferred on screen. It looks like a slot machine, plays like a slot machine, and voila - it is a slot machine. The backdrop is a NetEnt gaming lounge with plants and other slot machines so you feel you are in a relaxing gaming room. And when you play you hear the sounds of the ringing and clunking of the spinning and the jazzy outbursts when you win. If you love promo's, get the best slot bonuses in the UK. Founded in 1996, Swedish game developer, NetEnt, is licensed in Malta and since 2006 have grown in popularity to become one of the besk know slot developers in the world. Employing over 1000 people globally, they deliver premium content to many of the world’s most well-known online casino operators. 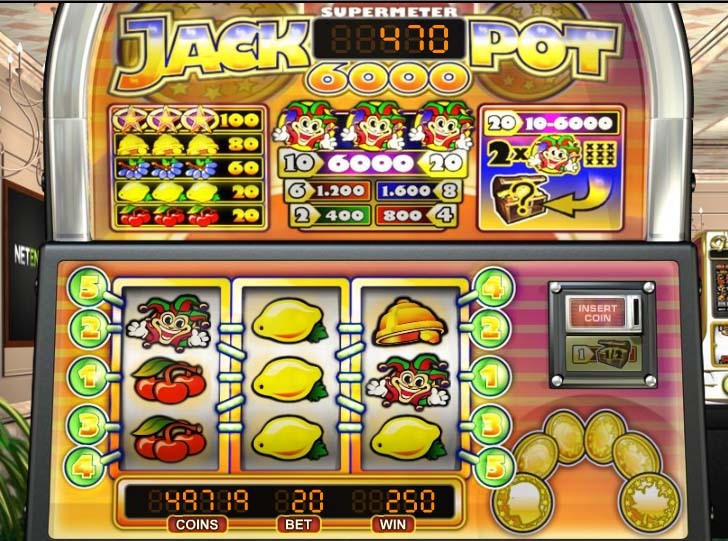 Jackpot 600 has a 3 reel, 3 row, 5 payline format. The aim is to line up the same symbols across the lines from left to right to make wins. There is a heads or tails doubling game to play if you win. And if you place the maximum bet and win, you can enter the supermeter mode. 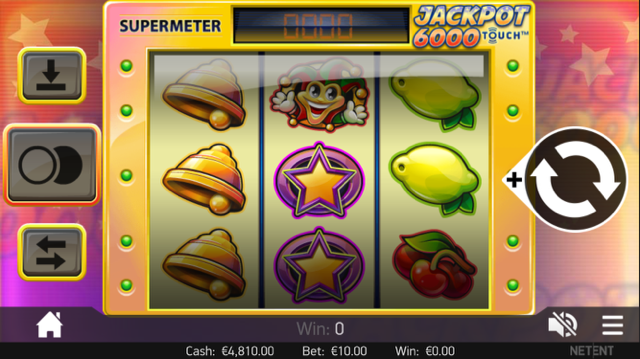 In supermeter mode, bet levels increase even higher, giving you the chance to win even more. The paytable is shown at the top of the slot machine on screen and you can click the question mark icon to read the game rules. Click Bet to choose the level you want to bet from. Clicking MaxBet will take you straight to the maximum of 10. Choose your coin. Then click Spin. This is manual only game which means you can only play manually, spin by spin, but that puts you in charge every time. There are five symbols – the star is worth most, followed by the bell, and then grapes, lemons and cherries. There is also the Joker which is the wild. JOKER – performs as a wild in the basic game. BONUS JOKER – If two jokers appear when you play the bonus game in Supermeter mode you win a mystery prize, and if three appear you’ll get the top prize. Each time you win, you can double your winnings up to a maximum of 3000 coins by clicking the Heads or Tails button on the slot machine. You don’t have to gamble all your winnings. You can transfer amounts of 20 to keep and play with what’s left. Or you can collect all the winnings and return to the slots for another spin. This mode requires an element of skill and you’ll only enter it if you make a win on MaxBet. When playing, If you see two jokers, you’ll win anywhere between 10 and 6000 coins. Once you win 6000 coins though you are returned to the regular mode. This is a classic game with enduring appeal and opportunities to play the doubling game and in supermeter mode up the stakes.